Amazon could connect the dots between crypto users and their identities. Giant gummy bears. Fake mullets. Even, yes, the kitchen sink. Anything you need (plus anything you didn’t think anyone could ever need) is for sale on Amazon. Soon, the e-retailer could sell something far more valuable, and in a much more limited supply, than any of that stuff: the identities of cryptocurrency users. On Tuesday, Amazon won a U.S. patent it submitted back in 2014 for a “streaming data marketplace.” That is, a marketplace of data streams, infinite ledgers of information documenting anything from people’s physical addresses to their internet use. Instead of selling a product, this marketplace would sell access to data. In the patent, Amazon lists several possible configurations and uses for their data marketplace. One focuses on cryptocurrency. A potential customer? Government agencies. 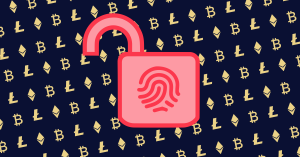 By design, it’s not easy to figure out the person behind a cryptocurrency transaction. Two parties just need each other’s crypto address, which is a long string of numbers and letters. Transactions are tracked in a long ledger that isn’t stored in any one place, so is pretty much impossible to hack. But finding out a user’s identity isn’t impossible. If you can combine that address with other information, the pieces start to come together. Amazon proposes doing exactly that — connecting those dots — through its marketplace. In the patent, Amazon describes a crypto data stream that starts with a list of all known bitcoin transactions. The bitcoin blockchain is public, so that information is easy to access and could refresh in near-real time. Here’s where the stream starts to get useful. Amazon or any other e-retailers that accept bitcoin transactions could publish the shipping addresses linked to the bitcoin addresses. That right there could be useful for identifying users, but Amazon takes the idea even further. Perhaps the buyer used a fake shipping address. Telecommunications providers could add their info to the stream by publishing the location of the internet protocol (IP) address associated with the transaction (presumably Amazon would pay companies for that info, though the patent doesn’t mention it). Finally, government officials could subscribe to the crypto stream in the data marketplace and use the information to crack down on crypto crime. For example, the IRS could track a person’s address in the bitcoin ledger. They could see how much money that person cashed out throughout the year to determine if they paid the right amount in taxes. If law enforcement agencies know that someone is buying illegal goods using a specific crypto address, they could search Amazon’s data stream for that address and see if a name turns up. This plan hinges on the idea that criminals would be dumb careless enough to use the same address for both legal and illegal transactions, which, let’s be real, probably happens. Amazon even suggests selling the data on a per-gigabyte (GB) basis, which would help them make buckets of cash off targeted searches. For now, this is just a patent — there’s no indication that Amazon will take the idea any further. Still, a number of government agencies have already expressed their commitment to addressing crypto crime. If they’re willing to pay for Amazon’s help, Amazon just might be willing to sell it to them.